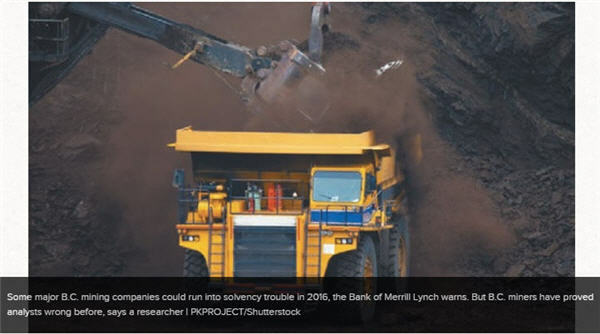 Mining companies like Teck Resources (TSX:TCK.B) and Thompson Creek Metals (TSX:TCM) may need to make some hard decisions in 2016 if they are to avoid solvency problems in 2017, warns the Bank of Merrill Lynch. In a recent outlook, Merrill Lynch singled out these two B.C. miners for solvency issues in 2017, and flagged First Quantum Minerals Ltd. (TSX:FQM) for solvency problems in 2018, based on commodity price projections and the companies’ cash burn rate. Cannacord Genuity has also red-flagged Teck. Of 11 mining companies it covers, Teck was the only one given a sell rating. The concerns being raised by investment banks over B.C.’s largest, most diversified and most successful mining company is a barometer for just how bad things have become for the mining world. But Andrew Kaip, managing director of mining equity research at BMO Capital Markets, said the same dire predictions were made about Teck in the wake of the 2008-2009 financial crisis and turned out to be wrong. He added that similar red flags were raised with large gold companies like Barrick Gold Corp. (TSX:ABX). “We saw companies with what was perceived to be outsized debt and in dire positions, and yet those companies were able to reel in their cost structure, cut their capital spending – through attrition of employees and through asset sales – to be able to move themselves into a stronger position,” Kaip said. “I think you’re going to see the base metal companies move in the same direction. Merrill Lynch’s commodities team predicts manufacturing in China will face “headwinds” in the first half of 2016, and that monetary policy will strengthen the U.S. dollar. Both factors are expected to continue to put downward pressure on commodity prices in 2016. While Merrill Lynch expects base metal prices to start recovering in the second half of 2016, it doesn’t expect metallurgical coal, which is B.C.’s second largest export, to improve until 2018. At the lower end of the mining business, junior exploration companies continue to be hammered by a lack of capital and investor confidence. It’s a global problem, and B.C.’s exploration and mining sector appears to be weathering the commodity bear market better than other jurisdictions, as evidenced by the number of new mine projects that have raised financing and appear to be moving ahead in 2016. There are four or five new mine proposals for B.C. that are in various stages of development, a couple of which will be moving forward in earnest in 2016. Pretium Resources Inc. (TSX:PVG) raised US$540 million in construction financing in 2015 for its new Brucejack gold mine in 2015, and construction is now underway. Just 16 kilometres from the Yukon border near Watson Lake, a private company called JDS Silver – a subsidiary of JDS Energy and Mining Inc. – is moving ahead with its Silvertip silver-lead-zinc mine, which would employ 150 to 200 people. “The CEO of JDS Energy and Mining called me and said that they had finalized their financing and they have shovels in the ground, I’m told, right now,” Bennett said early in December. There are other small mine projects in the works as well, including the Atrum Coal NL (ASX:ATU) anthracite mine proposed for a site near Stewart. And there is one massive $5.3 billion gold-copper mine that Seabridge Gold Inc. (TSX:SEA) is still trying to push ahead in northwestern B.C. While the number and size of new mines proposed for B.C. suggest there is still a lot of optimism about B.C. as a mining jurisdiction, that confidence in the sector won’t mean much if commodity prices don’t recover to the point where companies can make a profit. Prices are taking longer to recover than many analysts predicted, thanks to lower demand in China, a metals glut and downward pressure resulting from a strong U.S. dollar. This time last year, the one metal that was expected to rise in both demand and price in 2015 was zinc.